Born and raised on the Bay of Chaleur in Northern New Brunswick, Canadian Maritimes, Ken began cycling at an early age. He has always loved anything with two wheels and has owned many bicycles and motorcycles over the years. 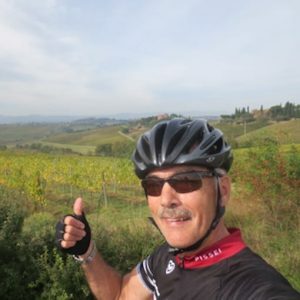 Ken is a very experienced cyclist and has biked across much of Italy, France, and northern Spain either on his own or with other groups and friends. He has also cycled solo or with groups and friends through the Canadian Rockies, much of British Columbia, Western Canada and the United States. Most recently he participated in his first tour with Ciclismo Classico. Ken is a passionate cyclist and outdoor enthusiast. He enjoys long distance riding, either on a planned route or Granfondo. He loves exploring new locations and adventures with friends old and new and with family. He sees cycling as a way to stay active and healthy. He loves meeting new people and has developed wonderful friendships through cycling over the years. As a cycling instructor, Ken is patient and focused on helping clients achieve their goals. He believes in putting his heart and soul into a bike tour to make it an enjoyable adventure for his guests. According to Ken, “By riding a bicycle in a new place, one learns about the land, the countryside and the community. Biking gives you that unique perspective and challenge like nothing else can”. In Ken’s spare time, he is an accomplished artist. His specialty is painting outdoor landscapes, the subject matter being formulated from the many places he has been on his bicycle. The Canadian Maritimes offers a diverse and beautiful landscape that is enjoyed by thousands of visitors every year from all over the world and by native Canadians. Cycling there will give you a unique view and experience as you interact with the land and the sea.